Legacy Fine Art & Productions, in conjunction with Yoko Ono and the Estate of John Lennon, presents a traveling exhibition of the artwork of John Lennon. The exhibit features original drawings and hand signed pieces, as well as limited edition prints. The show will be in Cape May, New Jersey July 20 - 22, 2007. 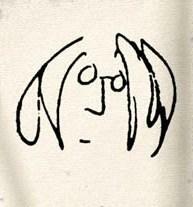 The image posted here is “Self Portrait” by John Lennon. See the Pop Life Art home page for links to the artwork of John Lennon and more than 70 other musicians, singers, and actors.